I'm ready for trick or treaters! Hopefully I'll get lots of of little ghosts and goblins knocking on my door tonight ... as well as Hannah Montanas, fairy princesses and pirates. If not, well, I'm sure I can figure out something to do with all that candy. I went shopping last night for an autumn centerpiece for the dining room table. I was going to get a dried flower arrangement or big candle, but ended up with this white pumpkin. I love ceramic and hand blown glass pumpkins. This one was only ten dollars at TJ Maxx Home Goods. The October theme for my ATC swap group was "The Witching Hour." I received some awesome ATC's! The one above is from Deb at Garage Sale Girl. From Dogwood at Pink Dogwood Blossom. From Rachel at Not-So-Plain Jane. Can you see Charlie lurking in the background? He was stalking the crepe paper pumpkin. It makes the loveliest crinkly noise when you smack it with your paw. From Jill at Mindfully Simple. Using the random number generator, the winner of the sugarcane yarn is DebsCrafts! Congrats, Deb. I'll be sending you an email soon. Hope everyone has a safe and happy Halloween. It's been a difficult week, but a little bit of light is beginning to shine through. I don't have much to say, but do want to share these photos of flowers from a walk last weekend at the San Francisco Botanical Garden. Hope you enjoy. Natasha at Artistic Creations came up with the best idea for a swap ... It's All About Me! The twist is that instead of making something for someone else, you make something for yourself. I think this is a great idea because we are so generous to one another, but it can be difficult to show that same kindness to ourselves. For the swap, I knit myself a set of Log Cabin Wash Cloths. You might remember I bought this yarn for my birthday a couple months ago specifically for these wash cloths. The swap helped motivate me to get them finished. Thank you, Natasha! The wash cloths are knit by starting with the middle square, binding off and then picking up stitches around the edge of the square. This project helped me improve my skills in picking up stitches. I feel much more confident with this skill. I tried to finish this scarf for the swap, too, but wasn't quite able to do it. The yarn is made of 100% sugarcane and is very nice to knit with. I'm offering a ball of the exact same yarn that I'm using to knit the scarf as a giveaway. It's called Ruca and is made by the company Araucania. It is hand-dyed in Chile and there is 263 yards. This giveaway is open to anyone, and I will ship it to any country. Please be sure to leave an email address if your comment doesn't link to your blog! I'll use the random number generator to pick a winner on Thursday, October 29th. Many years ago while visiting Yosemite National Park I watched a ranger do a slide show presentation called the "The Small View." Instead of showing slides of the massive granite walls that surround the valley or the incredible waterfalls, he presented images of a dew drop on a blade of grass, an insect perched on a leaf, and the tiniest flower bud. Throughout the presentation he talked about how the breathtaking, sweeping views of Yosemite can distract us from the tiny moments of beauty right in front of us. With that in mind, I went for a walk at my favorite park yesterday afternoon to take photos of the small view ... those little things I would normally miss because I'm usually scanning the treetops for owls (that I never see) or simply lost in thought and not fully present. I think blogging has helped me to appreciate the small view, too. In our blogs we are constantly celebrating small joys like veggies grown at home, late-blooming flowers, and finding a vintage handkerchief on sale. It's easy to miss those things if you aren't paying attention. There were lots of acorn caps on the ground yesterday. I wonder where all the acorns went? Oh, I think I found them! The acorn woodpeckers were extremely busy drilling holes and filling them with acorns. At times there was so much pecking going on it sounded like an audience's applause. But there are still plenty of empty holes to fill as they store up food for the winter. I was fortunate to snap this photo just as two woodpeckers flew in to view. This might be the last remnant of summer. I couldn't resist one or two larger views as the sky clouded up. The peak in this photo is Mount Umunhum, which is an Ohlone Indian word for the resting place of the hummingbird. Before I knew it, two hours had passed and I felt a drop of rain on my forehead. It was wonderful to spend the afternoon enjoying the small view, as well as the large one, too. This is my creative space. It's a tiny table in the corner of my bedroom crowded with art supplies and books. I keep saying I'm going to clean it up and reorganize it, but I never get around to it. The funny thing is, the space seems to work for me-- I've made lots and lots of art there. I find that funny because at my day job as a technical writer, I can't work in a messy space so I keep my desk spotless. But when I do my technical writing work at home, I'm more productive in my messy little space than anywhere else in my home. This is my latest ATC for a California-themed swap. I used my water color paints for the first time (thanks Katharine!) to make the background and enjoyed it so much. I was nervous about using them because I didn't think I knew how, but now that I've taken the first step I can't wait to play with those paints some more. This is one of my favorite places to walk near my home. It's a paved trail that runs parallel to the Guadalupe River. I usually see lots of birds, like Belted Kingfishers, egrets, herons, and hummingbirds. For some reason this particular walk really gets my creative juices going, and I often get new ideas for creative projects when I walk here. The trail goes to Almaden Lake. Isn't it gorgeous? It might look like I live in the country, but I actually live in a bustling suburban valley surrounded by mountains and open space. I finished knitting my Purl Bee dishcloth. It turned out okay ... not quite what I expected. I'm not sure I'll knit another one. Looks more interesting on the wrong side. While taking an evening stroll recently, I encountered a mama raccoon and two babies. Of course, I had to run home and grab my camera, even though it was night time and there was no chance of getting a decent picture of the little family. All I got was a shining pair of eyes. I've lived in my neighborhood for fourteen years, and this was only the fourth time I've seen raccoons. It excites me to see wildlife in my neighborhood. Do you have any special weekend plans? I have lots of housekeeping to do and hope to squeeze in a pedicure, too. NetFlix was kind enough to send me two movies that I think will be really good-- The Proposal with Sandra Bullock and My Life in Ruins with Nia Vardalos (remember her from My Big Fat Greek Wedding?). Have a wonderful weekend and talk to you soon! We've had torrential rain here for the past twelve hours or so. It's the first major storm of the season, and there was some flooding and power outages. Fortunately, the tiny flood outside my apartment shown in the picture above has already subsided. I worked from home today to avoid having to commute during the storm and enjoyed it so much. It was cozy working at my little desk near the window with the rain pounding and wind blowing outside. We've been in a drought for the last few years, so the rain is badly needed, but not quite so much at one time. It's going to clear up by tomorrow afternoon and then we'll have a few dry days before the next storm. I know this is a good thing because another day of rain like this would cause rivers to rise and mud to slide, but I love rain so much that I don't want it to end. We are supposed to have a rainy El Nino winter, and I'm keeping my fingers crossed it's true. Here are a few more signs of Autumn from my neighborhood. Aren't those shiny Liquid Amber leaves gorgeous? I'm knitting cotton dish cloths based on a pattern from The Purl Bee. Lately I've been enjoying their knitting patterns so much. I'm using Blue Sky Organic Cotton in drift and ladybug. It's soft and dreamy to knit with. The pattern is just a simple garter stitch, but it is so satisfying. 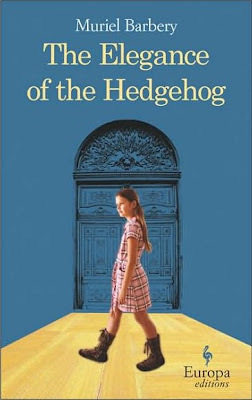 My pal Dogwood gave me The Elegance of the Hedgehog, and it is SO good. After months of reading romances and vampire novels, this book is like a gourmet meal for my brain. 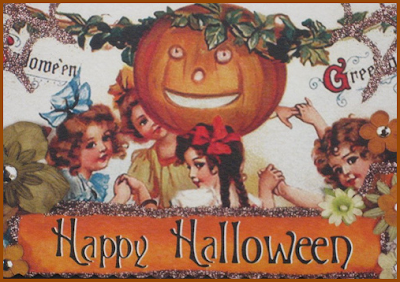 Last weekend I made Halloween greeting cards from vintage-looking postcards. They aren't very fancy, so I tried to spruce them up with glitter and the results were disastrous-- my television remote control is covered in orange glitter. I had to start over on a few of them. I can't show you all the cards right now because I want the recipients to be surprised, but I can show you this postcard since it's for Dogwood and she's already seen it. I love the pumpkin floating in the upper corner.